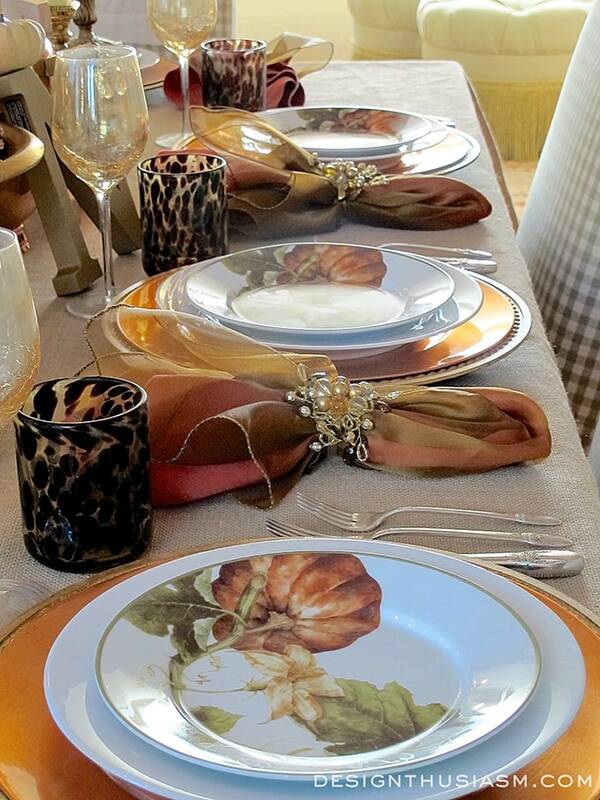 Do your holiday table settings tell a story? 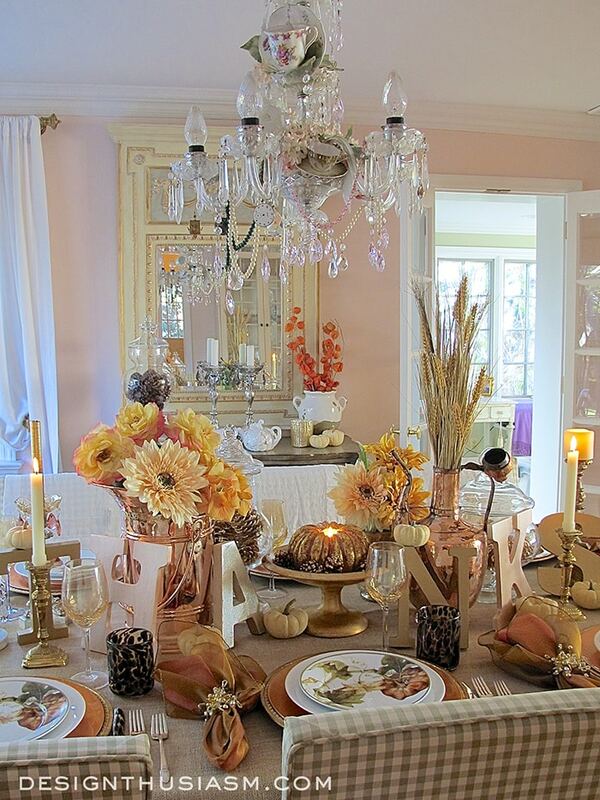 I’ve set many Thanksgiving tables over the years, and each one I like to be different. When I approach a setting, the first thing I think about is what is the mood I want to create and what is the message I want to convey? For this setting my thoughts were on the warmth of gathering with family and the sunlit tones that would channel that message. In most cases I start with a pattern and this tablescape is no different. I was crushing on these Williams-Sonoma salad plates last year and missed out on them, so the second I saw them back in play this year, I jumped at the opportunity and ordered them right away. I decided to draw out the copper tone in the plates, so my chargers are put to use here and balanced against simple white dinner plates from Crate and Barrel. Sprinkled about the table are some mini white pumpkins that have been wandering around the house throughout the fall season. Here I have one balanced on a section of the centerpiece, whose function will become apparent in the next few photos. The broad view of the table reveals my key concepts – the large copper receptacles that bring a burnished glow to the table, and my painted letters that spell out “thanks” across the tabletop. I promise you there is more paint and glitter on the kitchen table where I was working than on the letters you see here! The part of this setting I labored most over were the napkins. My bronze sheers were too brown over my white napkins and then I tried the russet linen ones which were too bright. Finally I had the epiphany to put the sheers over the rust to come up with this lovely almost iridescent copper shade. The sheers are from Pier 1, as are the amber jeweled rings, and the rust linens are from Pottery Barn. 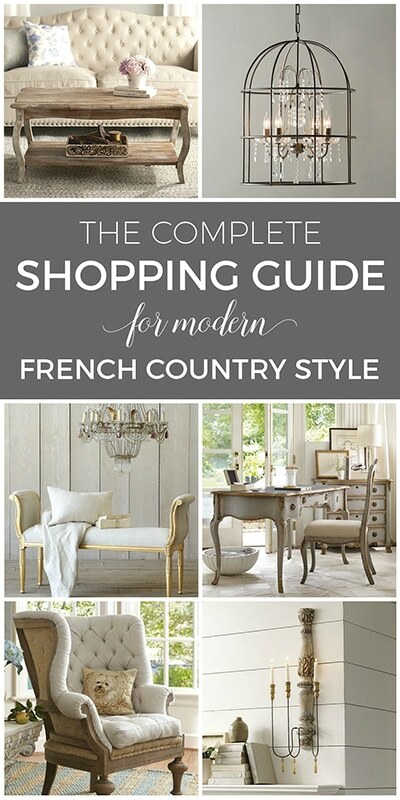 The warm tones are set against a backdrop of burlap tablecloth for a rustic homey feel. The golden crackle wine goblets are from Pier 1 and the tortoise shell glasses were bought online, but I believe are available at Pier 1, as well. 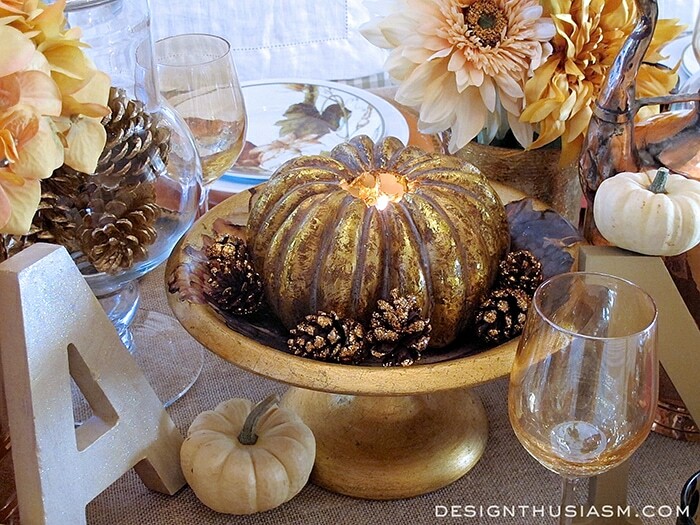 My gilded pumpkin candle has been featured in my settings before, but here is plays a smaller supporting role to the more dominant copper pieces nearby. This wonderful copper planter was found at Home Goods and filled with silks from Pottery Barn. Peeking out behind it you can glimpse a glass apothecary jar filled with gilded pine cones. As the pumpkins are packed away after Thanksgiving, you can expect to see the pine cones making various re-appearances in the coming weeks. 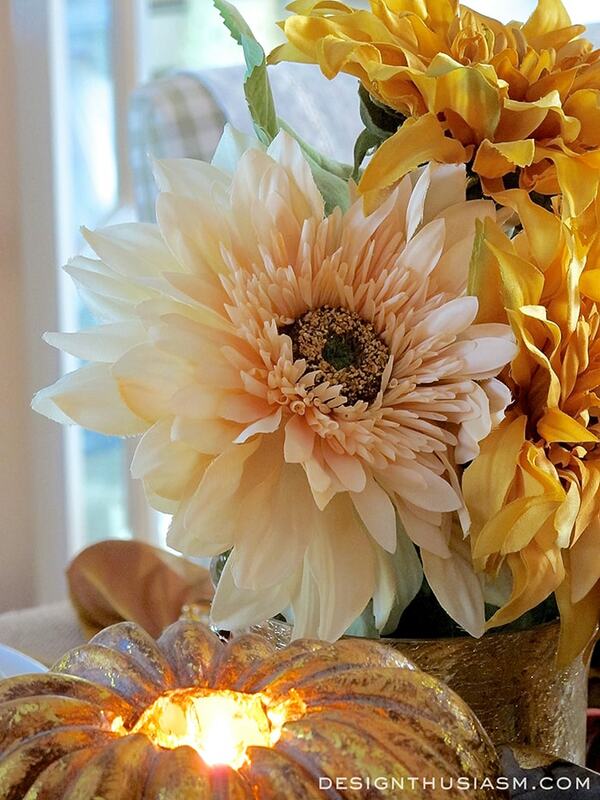 My centerpieces have gotten more and more sculptural with each setting I do. 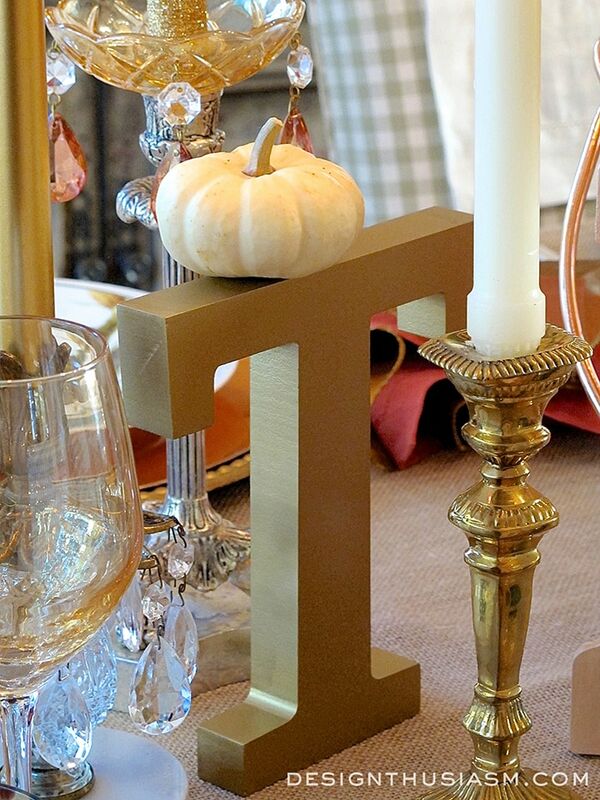 Here the “T” from “thanks” is mingling amongst the candlesticks and topped with a tiny pumpkin. As the sun hits the letters you can see the glimmer on the “A”. I used various iridescent paints and then dusted them with a touch of glitter. 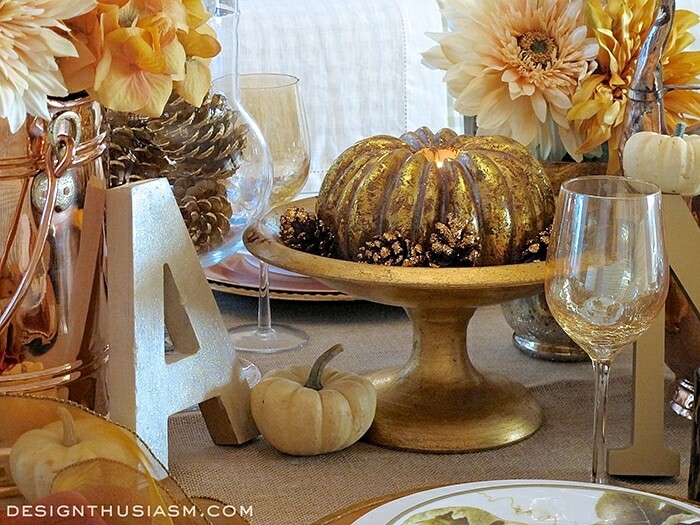 The tiny pinecones surrounding the pumpkin candle are also glittered in copper. You can see the second copper piece from Home Goods here, tucked with wheat stalks for height interest. The table seems to achieve the warm copper glow I was hoping for. Given that this is the real setting I will use for the actual holiday, I will likely replace the flowers with fresh ones. But this faux dahlia really does win my heart. Perhaps the fresh flowers will go on my second table that will be set in the kitchen. I wish you all the happiest Thanksgiving Day!! If you’ll be having a quieter meal with perhaps just one other person, take a look at my Romantic Thanksgiving Dinner for Two. However you celebrate, I hope you all have much to be thankful for! Linking with Inspiration Monday, YourDesignsThisTime, BNOTP, Inspire Me Monday, Inspire Me Tuesday, Coastal Charm Tuesday, The Scoop, Twirl and Take a Bow, Wow Us Wednesdays, Home and Garden Thursday, Jan Olson Thursday, Beyond The Picket Fence Vintage, From My Front Porch to Yours, Feathered Nest Friday, Show and Tell Friday, Shabby Nest Frugal Friday, Funky Junk Interiors, Best of the Weekend Party, Thoughts from Alice Sundays, Silver Pennies Sundays. That’s beautiful. Love the warm colors and the copper glowing. There is no way to list everything that I LOVE about this table. The salad plates are divine…so glad you got them. 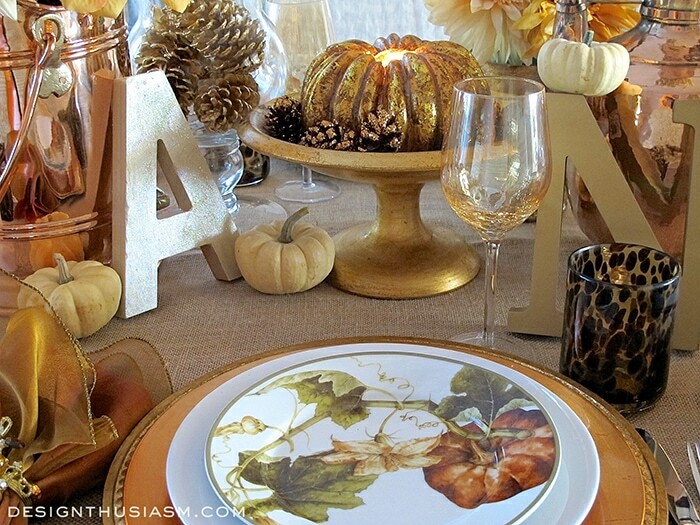 The way you used the letters as part of your centerpiece…well, I’ll just say GENIUS and so creative. 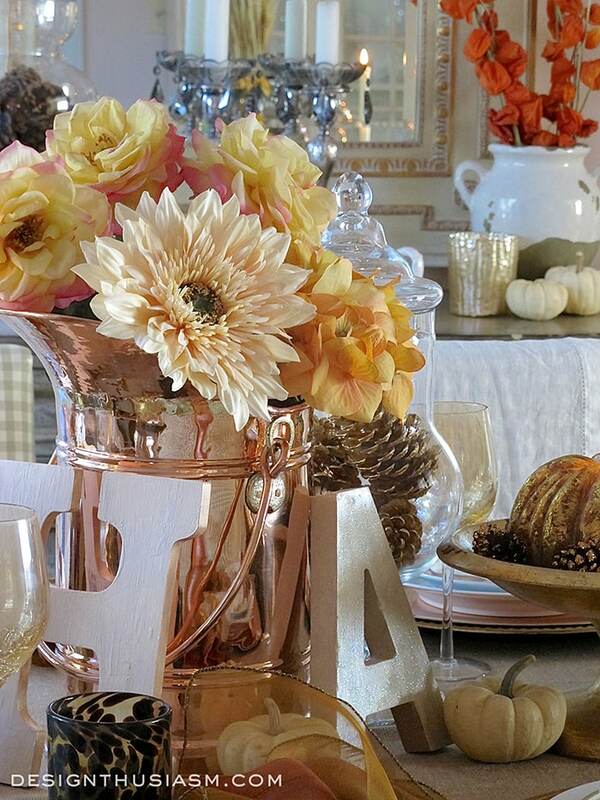 Love all of the copper colors! Beautiful! Thanks so much, Bev! I do think my tables are getting a little too busy. Looking forward to January to do some all white… lol!! But for now I’m enjoying all the warm glimmer… 🙂 Thanks for stopping by! Gorgeous! 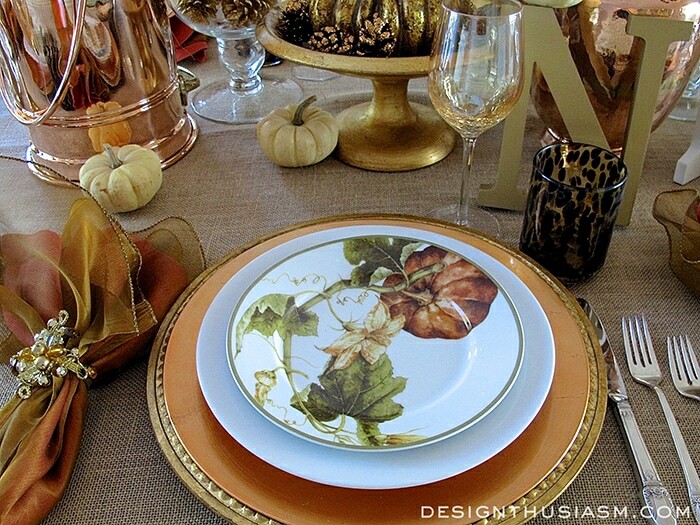 Love those plates and can see why you didn’t hesitate to get them this year! You’ve done a great job at making everything coordinate with them. The letters make a unique centerpiece when interspersed with the other elements. 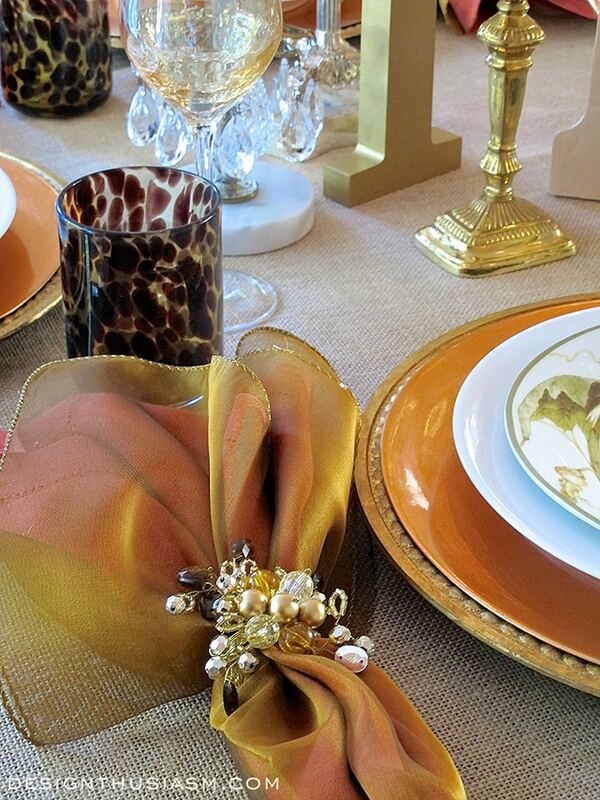 Terrific idea to layer your napkins as they look fab and those napkin rings are “icing on the cake”! The burlap tablecloth is the perfect backdrop for this table setting! We’ve already celebrated TG here in Canada but I’m wishing you a very happy one there on Thursday! Visiting from Sat Sparks at Pieced Pastimes. Thanks so much Lori!! I hope you enjoyed your Thanksgiving last month, too… 🙂 Thanks for stopping by! Those plates really did drive the whole look of the table and once I tapped into the copper idea, everything just followed. Will try to give your page a visit when I get back this evening. 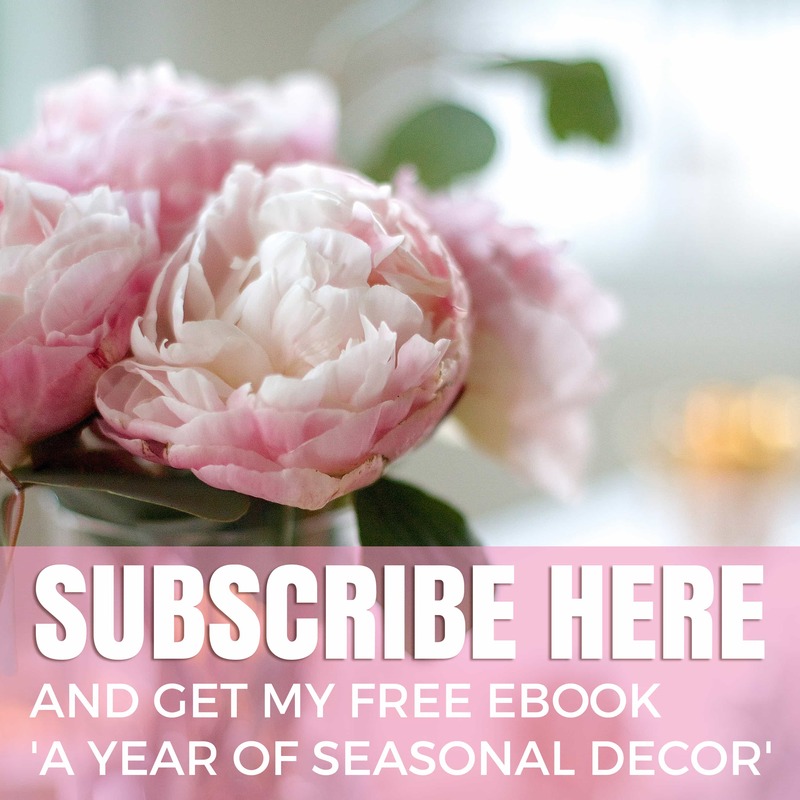 I’m still pretty new to blogging and time management is still an issue. 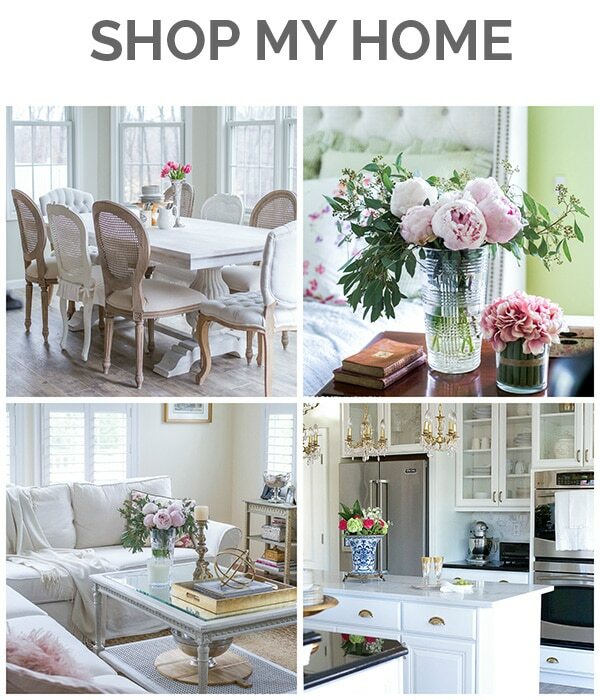 I’d love to just sit here all day reading all of these inspiring blogs! 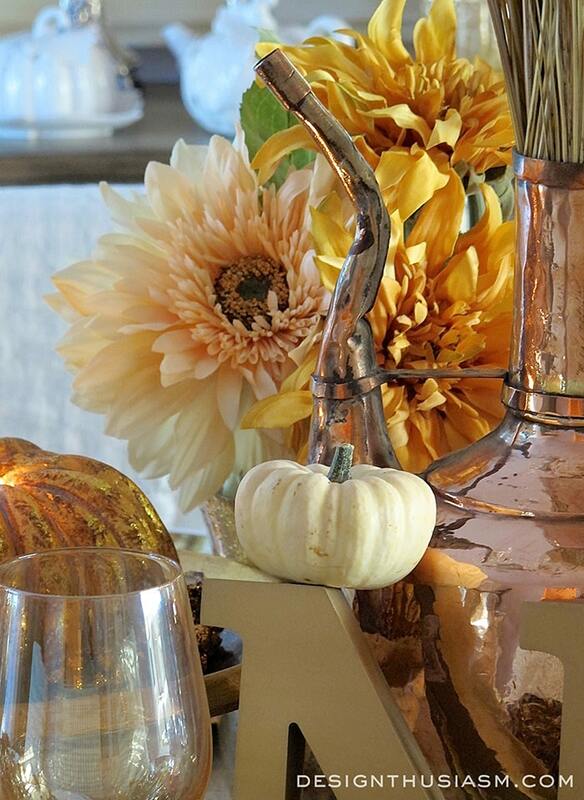 I really like your use of copper, such an inspired idea for autumn! Thanks so much, Christine! At first I was going to use all the same style letter, but they didn’t have the “H” and I couldn’t very well put “tanks” on the table… 😉 Decided to mix it up and paint them instead. Lory, it certainly is a gorgeous table! I love the gold and copper tones. The giant letters are so fun and I love those plates! Wishing you a very wonderful Thanksgiving! Thanks for sharing with SYC. 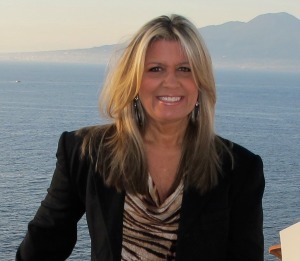 Thanks so much, Jann!! 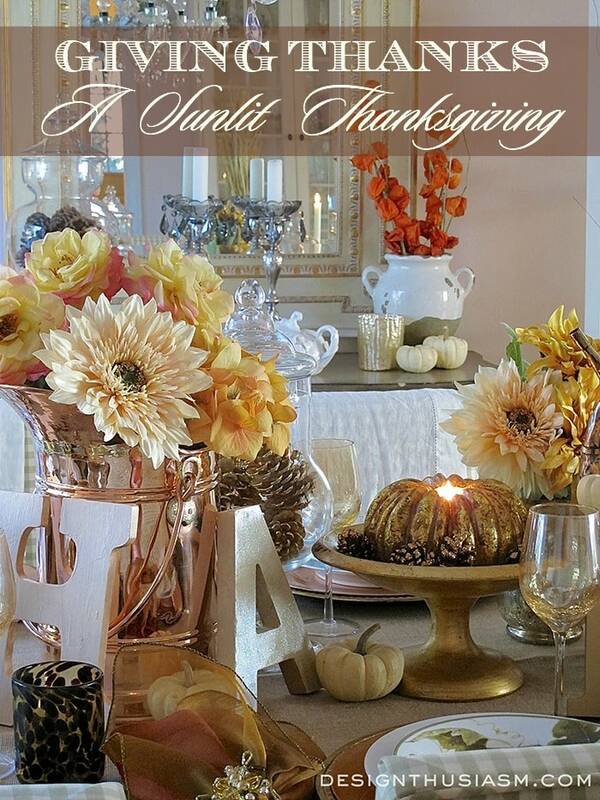 Wishing you a fabulous Thanksgiving, as well! 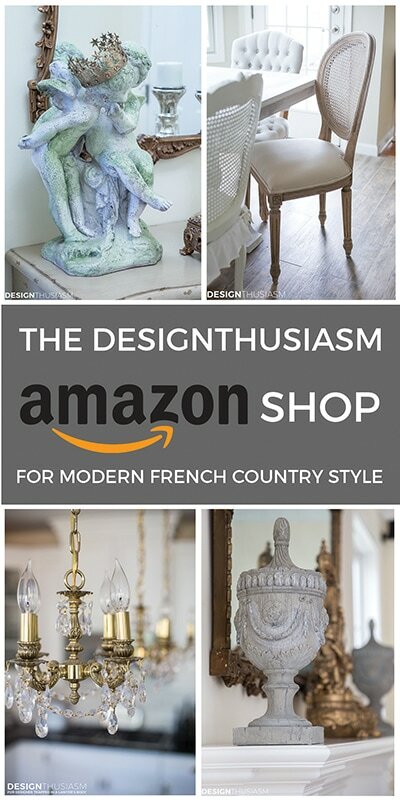 Every tabletop that you design is exquisite! Where did you get your white chair seat covers? I’ve been looking for some for a long time! Hi Mary Lou! If you mean the green check ones that cover the entire chair, those are from Ballard Designs. If you mean the white linen draped over the tops, those are just placements that I draped there to lighten the effect… 🙂 Thanks for stopping by!! Lory, you are the queen of tablescapes! I know this is an old post but I’m hoping you see this question, actually two. #1. 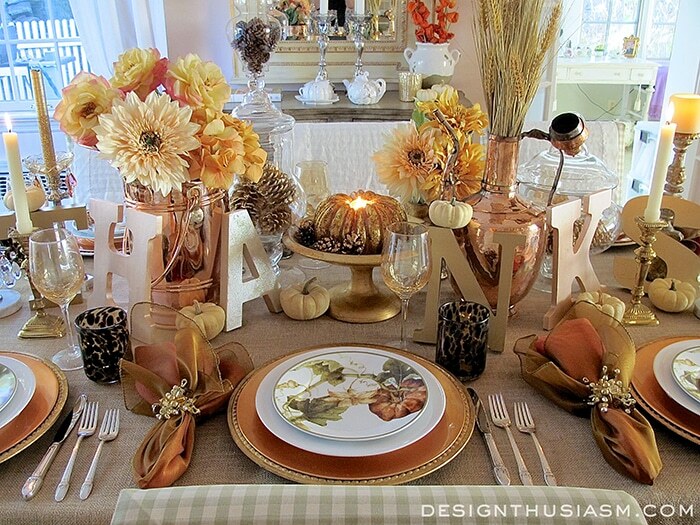 Where do you put the food you are serving because the table is already covered with the tablescape? #2. Do guests find it awkward to have to deal with two napkins since you frequently use double napkins in your designs? Thanks, Cindy! I typically either serve the food buffet style on the island or plate it in the kitchen and serve at each place setting. I never put platters of food on the table.